No she said it, I actually saw her press briefing outside the SC. Just when you think these darbari have reached their limit they come up with something new. So the kids are being asked about how the billions that are being sent back to Pakistan have been earnt. So far all we know is that everyone is dependent on everyone else, so where is the loot coming from? For corruption case, you need to provide evidence of corruption. And I do not see it. Sharif's has lied so much but also created sufficient confusion. Even if I humour you on this false logic of yours there is still the small matter of a Pakistani evading taxes in Pakistan versus a Pakistani evading taxes in the UK. If IK didn't pay his taxes in UK you cannot prosecute him in Pakistan. They cannot account for ANY of the cash flow going from A to B to C (this is not me saying this, the counsel of the PM's exact words were this). Not only this but three different stories for each time they were questioned. It is dishonest and the only source of this cash would have been from Pakistan. Its the most open and shut case there is, it also fits the perfect definition of corruption and we still have people like you saying there is no evidence. The only place any confusion has been created is with his well-wishers. Last edited by Pakpak; 18th January 2017 at 21:52. Nawaz Sharif giving a talk in Davos on how to fight corruption is as ridiculous as Altaf Hussain giving a talk on how to fight terrorism. How shameless can you be to show your face on a talk platform where the topic is corruption and you yourself have a case going on in your country against you about corruption. I'd feel embarrassed as hell. But then again I have shame. small vs big crime or sin, IK did (or still doing) as per his capacity and reach. AAZ/NS did (or still doing as per their capacity and reach). I think we should have a separate thread of IK's "small mistakes". anyway, PTI can only take political mileage from this issue as SC "main function is to save the system" as SC would not let system derail. 0.00001% chance of PM resigning, but another Sharif would take his place and PML-N would play victim/anti-establishment card. Indeed. Shame is clearly an unpopular trait when it comes to the Sharif dynasty. IK is corrupt in his capacity, he misused his powers as a chairman of PTI at the least. However, this topic is for another thread. Open up a thread about that and people will discuss it. Nawaz's mass looting has nothing to do with IK's ''misuse of powers as chairman''. Nice try at deflection, typical for Noon fans, sadly for you I won't rise to your bait in this thread. Last edited by Pakpak; 19th January 2017 at 00:25. Read the reply above me and shake your head. If I was the mediator I'd love to ask him there, point blank. My friend you sound like a typical uneducated Noora, read up on the difference between evasion and avoidance, there is a big difference. The Sharifs joined politics to make money through theft and evade taxes, IK used UK law as a non domicile to legally avoid taxes. Whatever the outcome from this corrupt SC, the Sharifs and their supporters have been humiliated everyday and it was IK that did it. I am not so sure that "uneducated noora" are following IK's twitter feed. I would not respond to your other point cause then Pakpak would say "Nice try at deflection, typical for Noon fans"
Please open up a thread on evasion and avoidance so that we can educate you. BTW being able read something literally and understanding what was said are two different things. Now that it's the turn of N league lawyers to get a spanking at the hands of judges, pathetic ministers offer a truce so they don't get exposed. Today the Nooras planted a fake story about the BBC backing down about their story and the BBC told them to buzz off, the story is true. Last edited by Muhammad10; 19th January 2017 at 22:17. Its hilarious. They're so far stuck in their lies now. Top leaders in the parliament such as Khursheed Shah, Ayaz Sadiq are seeing what is happening to Nawaz and they know how much money they themselves have looted and stashed in their accounts. So suddenly they have declared that the accounts with upto ''PKR 100 million is not ours, someone set it up in our name and did all these transactions''. You couldn't make this rubbish up. Last edited by Pakpak; 20th January 2017 at 15:46. Lol oops... I think I'm dyslexic.. If the judges show little bit of courage, they can disqualify Nawaz Sharif on the basis of lying in the parliament as everybody knows Nawaz Sharif did lie in the parliament. But I feel judges are not that courageous. Seems like the judges are trying to find a way out for Nawaz. Today in the court they said "it has not been determined that the Sharif's owned the flat prior to 2006". If somebody wants to not see something they will not see it even if it is staring them in the face. The ownership of the flats has been already proven and the time frame has also been proven but the courts are not willing to buy it. Saray bikay howay hain bhai..
You're right. There should have been no doubt left after the BBC report. It's not a matter of courage. It's a matter of legal jurisdiction. The matter is beyond the jurisdiction of these judges. A lot of posts on this thread are so naive. People need to understand that courts are bound by the law and they can't just go and do anything they want. Your post, like all Noon fans, is clutching at straws. The judges have all the jurisdiction. The PM only gets immunity from court if he states something in the parliament that is a matter of his opinion. He was, however, asked a question regarding his finances and he gave his answer (supported by apparent documents). This statement hence wasn't his opinion, but according to him, a matter of fact. And that means his immunity is gone. And even if its not, he has lied enough times in the SC. Gilani was dismissed, much to the delight of everyone especially PMLN. This is not your galli-mohallay ki court that it has no jurisdiction. Its the top court in the legal tree in this country. If this court has any legitimacy it will send this corrupt crook packing. And even if he is let off, his lies are so obvious that only the corrupt crooks will support him. I always thought Khursheed Shah as a richly corrupt politician. Har din aek nayi kahani ati hai yaar.. do din pehlay umeed hogayi thi, aj phirse down..
As per BBC report, it was owned by some company. the Nielson and Nescol offshore companies purchased the flats in the 1990s and there has been no transfer of ownership ever since. Documents have also revealed that another flat “12-A” located in the same block of the Mayfair apartments is owned by a British company Flagship Investment Ltd. 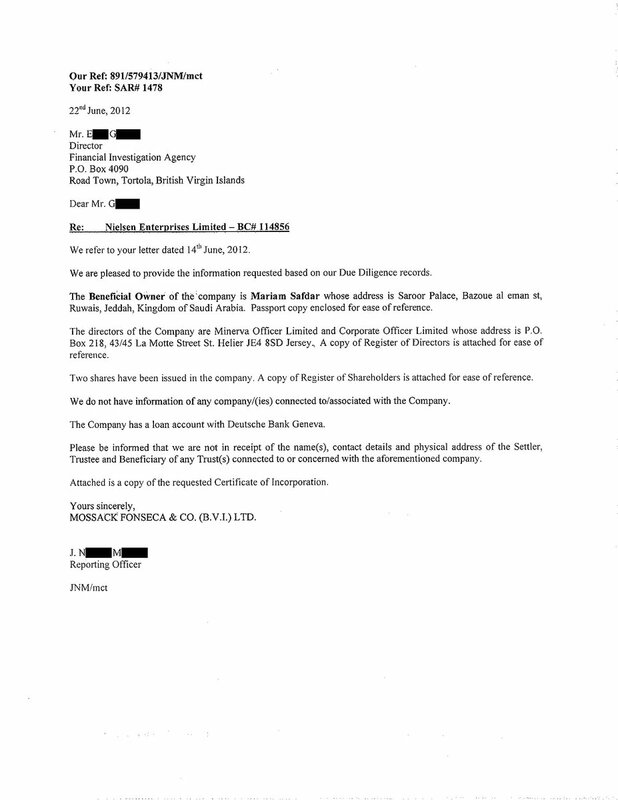 According to this company’s documents, its director is none other but premier’s son Hasan Nawaz. The said 12-A flat was bought by Flagship Investment Ltd at Avenfield House on January 29, 2004. According to a company that keeps record of corporate organisations, Hasan had started the said company in 2001, which has his address same as of the Park Lane flat. Meanwhile, Hasan is the director of four more companies, which have the address of the same Avenfield House flat. According to the documents of a property buying and selling organisation in London, the first flat in central London’s Mayfair residence was bought at 17 Avenfield House by Nescol Ltd on June 1, 1993. The second, flat 16 was bought by Nelson Enterprises Ltd in the same building on July 31, 1995. The third flat, 16-A, was bought on the same date by the same company while the fourth, 17-A, was bought by Nescol on July 23, 1996. Yes we know....as it says there the companies are owned by his son. The other companies such as Nescol who bought the flats in 1996 and 1995 are owned by Maryam. I am not sure what you're trying to show us here? This was all common knowledge that they owned the companies. What they denied was ownership before 2006. The above proves it conclusively. so it's a fair assessment by the judges that it is not yet established that that property belonged to NS. These properties were owned in 1995 and 1996 by Nawaz's kids when they were teenagers and are worth millions of pounds. Have you been following the case at ALL? Nawaz had denied the properties were owned prior to 2006, which he denied for a very good reason. As after 2006 his kids would have grown up and hence he could have said money was their own investment. We now know, with the report quoted above, they were owned prior to 2006. Last edited by Pakpak; 21st January 2017 at 00:25.
these allegations not good enough in the court of law. They are not allegations anymore, they are facts. The above is established now, if you've been following the case at all. Whether they are good enough or not time will tell. Unless the court has notified you of their position already. Again, a very naive post. Do you even know why Gillani was dismissed or are you really that stupid? Gillani wasn't dismissed for anything he said in the parliament. He was dismissed for contempt of court. The two cases have nothing in common so you quoting Gillani's dismissal in this discussion makes no sense whatsoever. Now moving on to the other point. Can you please read Article 66 of the constitution of Pakistan and tell me where it makes a difference between an opinion and a fact and where it states that immunity can only be provided to someone who gives an opinion? You really need to stop making up your own law. Fact of the matter is that this court has no jurisdiction over the matters of the parliament. You can make up your own laws or cook up your own little stories in your head but that won't change the fact that article 66 provides immunity for anything stated in the parliament. The PM was not expressing his opinion, the PM was stating facts as he knew it (or distorting them liberally). Expressing an opinion would be the PM giving his input about a law that is coming into force of give any input regarding a policy. Furthermore, the very first line of the article states ''subject to the constitution''. The constitution does not allow corruption neither it allows lying in a court of law. He qualifies for half the clauses of A.62 as well. This is not only me saying, Justice I. Chaudhary (ironically a Noon man) and a number of people have said virtually the same thing. I am also not ''cooking up facts'', I am an ex-lawyer in my previous career and know very well how laws and legal jargon can be twisted either way. And even then, the court does not really have to rely on his lying speech, the evidence provided by his team with no money-trail and the BBC report is shoddy enough to dismiss him. If you're calling others stupid then look in the mirror, instead of being appalled at your leader you, like any crook's supporter, come here offering legal technicalities so he can be saved. Last edited by Pakpak; 21st January 2017 at 14:23. It doesn't matter since the court has denied him immunity and said his speech can be used as evidence. This should settle it then. Guys this whole thing is academic, you know he will be let off. I am just saddened that despite so much evidence instead of condemning him his supporters are looking for loopholes. How much more blinded can one be? Let's face it most of the Nooras have about as much morals as the local alley cat. If the PM of a country is corrupt and steals money from the mouths of the poor, and people still support him, it says two things, firstly- he is a thief and his supporters have no morals. Well said.. people who support corruption are themselves corrupt and Nawaz's theivery benefits them in some shape or form. I think by this point even PTI believe that there isn't enough evidence against Nawaz to disqualify him however, there may some sort of verdict against the children. This is more than enough evidence. The stumbling block was proving ownership prior to 2006, which has been proved and which also proves that the Qatari letter was a complete lie. Furthermore, since he has not been provided immunity, his statement in Parliament AND in his national speech contradict directly with the evidence given in court. Which again, while being slimey, wasn't an issue because PTI could not prove ownership of said flats before 2006. That has now been proved, however. The reason PTI believe he will be let off is because our courts don't have a stellar history of handing out justice, especially under this PM and the pressure he will exert and the same guy who had the SC attacked in 1998. I mean this entire petition was earlier thrown out by SC for being 'frivolous'. The children cannot be punished without him being punished. If they are punished for buying property worth millions when they were 19-22 years old, then that much capital could only have come from their father. Especially since Maryam on all her forms listed herself as her father's dependent. And the money-trail for which has not been provided and as per the PM's counsel in December: they admitted they have no money-trail to prove their case. Last edited by Pakpak; 21st January 2017 at 22:35. Btw apologies for getting heated earlier. I am sure we are all patriotic Pakistanis. My gripe is not with PMLN, but with Nawaz. Every party has good and bad apples. judges can make judgment based on the number of contradictions by the PM i.e he said something else in his speech, different by his lawyer in the court, different by his sons on the same issue. Also we should not forget Nawaz Sharif and his family has failed to give evidence in the court that support their claim as well. Yes, we all love PK bar Nooras(AZ loyalists in the PPP) who value money and family loyalty over everything else. If IK stole money from the poor, I would hate him more than any Noora or Zardari loyalist. The poor have been dealt a very difficult hand, and if we the educated can't condemn the thieves, who will? Last edited by Muhammad10; 23rd January 2017 at 23:18. I think the judges are waiting for a written and verbal confession from Sharifs saying "yes we stole money", even then the judges will say bring proof. Isko kehte hen apne paon per khud kulhaari marna Debaris were attacking this german newspaper yesterday and now that newspaper is coming up with more and more docs! There are hundreds of billions involved in this case and also the future of their politics so don't be surprised if they lie i have seen people in lower courts lie on holy QURAN just for a few thousands rupees we are the one of the most corrupt nation in the world. Not very long same Sharif family lied to the whole nation and their supporters about their agreement with Musharraf sitting in holy place. Do you really think that people who steal from the mouths of hungry children, will have any scruples to falsely putting their hands on the Koran. These people can not be trusted. Respect for Anwar Baig he is not a typical derbari and isn't interested in defending his leadership and sharif family. We need more people like him in parties. The lawyer of Maryam Nawaz Sharif is saying that the signatures of Maryam Nawaz are fake on that document. Justice Ijaz Afzal said that we may need forensic expert to confirm that signatures are fake. But Justice Azmat Saeed Sheikh said that signatures look fake and he can see it without even using the glasses. As I mentioned before the court looks like will give verdict in favour of Nawaz Sharif and family. Time and again they have showed their intentions. He will be asked to give istifa soon "to save jamhoriat"
You are quoting from jang media group which is currently sitting on Nawaz's lap. Actually the SC judges are grilling both sides of the argument and trying to come to the correct solution. ISLAMABAD: The Sharif family on Thursday submitted another letter from a Qatari prince in the Supreme Court to establish the money trail of London apartments. The London apartments are at the centre of the Panamagate case being heard by a five-judge larger bench of the Supreme Court. In his second letter to the apex court, Qatari Prince Hamad Bin Jasim Bin Jaber Al Thani claimed that an investment of 12 million dirhams contributed by Mian Muhammad Sharif (father of PM Nawaz) was made “by way of provision of cash”. The statement submitted in the apex court by the premier’s counsel Advocate Salman Akram Raja, further stated that an amount of $8 million which was due to Mian Sharif, was settled “by the way of delivery of bearer shares of Nescol Ltd and Neilson Enterprises Ltd to a representative of PM Nawaz’s son Hussain Nawaz in 2006”. In November last year, the Sharif family revealed that the four luxury apartments were purchased through offshore investments involving a member of the Qatari royal family. A letter purportedly written by a Qatari prince claimed that the London properties were proceeds of their real estate businesses in which the prime minister’s father, Mian Muhammad Sharif, had invested 12 million dirhams in 1980. In the earlier letter, the Qatari prince stated that his father had longstanding business relations with PM Nawaz’s father which were coordinated through the prince’s eldest brother. “As per my understanding at that time an aggregate sum of around 12 million dirhams was contributed by Mian Sharif, originating from the sale of business in Dubai, UAE,” it said. Meanwhile, PM’s sons Hassan and Hussain Nawaz also submitted their replies in the apex court with certain facts and documents to establish the money trail for the purchase of the offshore property. In his reply, Hussain claimed that he completed his education in the UK in 1996 and was involved in father’s business till October 1999 in Pakistan. During the hearing, Justice Asif Saeed Khosa, who is heading a five-judge larger bench of the apex court to hear a slew of petitions filed against the Sharif family over alleged corruption, asked Advocate Shahid Hamid, the Sharifs’ counsel, to provide dates of the gifts given by Hussain to Nawaz, Nawaz’s gift to Maryam Nawaz for purchase of 143 kanal land and Maryam’s gift to the PM. The top court also sought the complete record of the gift transactions from the Sharif family. The Sharif family’s attorney faced a tough time in the Supreme Court on Wednesday as judges looked to him to clarify the money trail for London apartments. On the 15th hearing of the case, a five-judge bench — headed by Justice Asif Saeed Khosa — examined the issue of whether PM Nawaz’s daughter Maryam Safdar was his dependent and whether she is a beneficiary of the London properties or had acted as a front-person for her father. If the Qatari Prince had lent the money (cough cough) then surely this should have been disclosed to the Tax Authorities at that time? It is not only common practice to do this but any businessman would declare this loan for corporation/income tax basis. Also, wasn't the Mill in Dubai bankrupt leaving millions owing to BCCI Bank? So how could have been sold for a profit? Aitzaz Ahsan saying Sharif should be disqualified. The case is very strong; everyone knows NS is lying. Aitzaz from day 1 is saying this is an open and shut case. Then the obvious next question is why Aitzaz shahab himself didn't get involved in the case when he one of the best lawyers in Pakistan. Sometimes when the fight is for the future of Pakistan you have to rise above political difference. True. Today, he said the same; the Qatari letter holds no value.